Marathon training is going so much better than I expected. I’ve been so wrapped up in it that I’ve forgotten to blog with my weekly training recaps, so here’s a little catch up of the last four weeks! 45 minutes easy in the morning. 5.03 miles at 8:58 average pace. I was taking my first Cyclebar class in the evening so I decided to run over to Fulton Market as my commute. 1.25 more miles run and then a 50 minute ride at Cyclebar. This was my first time at the studio and I loved it!! Can’t wait to try out more classes and other instructors. I met up with Carly to do her speed work with her. It was seven 800 meter repeats with 2 minute rests in-between. With warm up and cool down it ended up being 7.50 miles. I was happy to have the speed work done early in the week and felt strong throughout all the reps.
Easy 50 minutes in the morning at 9:10 average pace. Not all runs are spectacular or eventful, but these average days with average miles all add up to strong races. Logging the miles matter! Evening Hot Yoga Flow at Studio Three with Carly and Cara. I’m falling more in love with yoga every single time I go. My body is craving it and I’m constantly surprised by it, but I like it. Easy 45 minute run. More miles in the bank! I’m liking these timed runs so I don’t have to focus on hitting a certain distance. I was in the suburbs for the holiday weekend, so this long run was done alone. I averaged an 8:33 pace for 11.05 miles, explored some different neighborhoods and enjoyed the alone time. The change of scenery and hilly route was good for the soul. Planned rest day, so rest I did! Five easy miles with Kyle after work. I wasn’t motivated to run today, but Kyle told me he’d go with me so that I got out. I’m always grateful for his support, but especially when it makes me better. Our runs together are always fun. An extra day off meant a chance for some extra workout classes. I started with Katy’s hot yoga flow then took Sayre and Andrea’s cycling class. It was so nice to have the extra time in the studio. I finished my workout with 4 easy miles since I wanted to run too. It was a little much, but I felt good! Took an AM hot yoga class at Corepower Yoga and then joined the group for a speed workout in the evening. 30 minute progression run with splits of 7:46, 7:44, 7:32, 7:19, and 2:26 for the last 0.35 miles. With warm up and cool down we totaled 8.74 miles at 8:12 average. I loved this workout! Thursday 7/6 – Rest day – Graduated physical therapy! I had my last day of physical therapy!! Made it a rest day besides that appointment because I had a busy day, but I did a lot of hip and ankle strengthening. Long run Friday this week before a trip. Megan met up with me to get the 12 miles in before work and I’m so so grateful. I needed the buddy as extra motivation to get out and get it done. It was a hot morning, but we kept an under 9 minute pace and logged the miles. A lot of summer runs are truly just about getting the miles in. I made Saturday my rest day since I was traveling to D.C. and got my long run done the day before. Sometimes you just have to swap around your training schedule to make everything else in your life work. Kyle and I wanted to go out and explore D.C. on foot so we went on a relaxed run and stopped at several monuments along the way. We ended with 4 miles, lots of sweat, and big smiles. I love exploring with him. I was in D.C. for work this week, so I ventured out of my comfort zone and took a yoga class at Epic Yoga D.C. by myself. I loved it! It felt great to start my day with yoga. Then I went out to get in 5 easy miles before I had to be at the conference. D.C. is HOT. I struggled with all of my runs here. I had 60 minutes on the plan for today and I didn’t end up getting outside until after 7 PM when it was still 95 degrees. I kept my pace easy and tried to just get the miles in. It didn’t feel easy that’s for sure. This speed workout was a failure, but at least I tried. I was supposed to do 4-6 800 meter reps and I only ran 2. It was brutally hot and I felt dehydrated and dizzy, so I didn’t push it. With a warm up and easy couple miles after the reps I totaled 4.50 miles. Some miles are always better than no miles! Rest day travel day to finally get back to Chicago after my cancelled flight the day before. I was tired and very ready to be home and back on my normal schedule. I was really wiped out after my trip, but I still managed to get up for my easy 50 minutes of running before work. 5.80 miles in total. 8:38 average. It was hard to slow down because Chicago almost felt chilly compared to D.C. and it felt so great to be home. After the race expo I ran 1.23 easy miles with Kyle to go get breakfast. Just used it as a form of transportation and a quick way to shake out my legs. Always happy when he suggests going on a run together. A new half marathon PR?? I was shocked. I didn’t go into this thinking I’d have such a fight in me, but luckily I had Jenny next to me the whole time and we realized we were capable of a better race than we thought. Finished with a time of 1:36:31. 7:22 average pace. A full 2+ minutes shaved off from my previous PR. I was so happy. This race deserves a full race recap, so that’s coming soon. And I ended my Sunday at Katy’s 75 minute yoga flow because what better way to end my weekend? I needed some recovery miles after the half marathon on Sunday so I went out for four easy. My pace was actually faster than intended, but it felt easy. I ended my run right at Mobile Health and Wellness for an hour of massage and cupping. Recovery is so so important and I felt amazing after my session. A double day at Studio Three! 6 AM Hot Power Yoga to start the day and a quick Torch 45 interval class at lunch time. It’s really hard for me to squeeze in a lunch break workout, but I made it work. I ran the half mile from my office to the studio, took class, then ran back with my free sweetgreen salad in my hand. Not a bad break in the day! Totaled 2.75 miles with the treadmill intervals in class. Fartlek speed workout this Wednesday. The workout itself was very random, but that made it fun. The longest ‘on’ rep was 6 minutes and the shortest was 1 minute. The ‘on’ reps totaled 15 minutes with equal recovery jogs after each one. With warm up and cool down we ended up with 8.25 miles. I started my cross training day with Katy’s 6 AM Hot Power Yoga and then took Dani’s cycling class on my lunch break. My favorite ways to cross train! I switched up my schedule a bit and took my rest day on Friday so that I could get my long run in and the BTN 10K over the weekend. I knew I needed a rest day! The group run got cancelled due to thunderstorms, so I ran my 10 miles solo. It was kind of nice to just zone out and cruise. I averaged an 8:22 pace and focused on a fast finish. I enjoyed the solitude and my legs felt really good. Decided to just treat this 6.2 mile race as a training run. It was super hot/humid and I wasn’t feeling very well. I stuck with Carly and we crossed the finish line in just under an hour. Still a fun race and I’m glad I did it! Then took Katy’s evening yoga flow at Studio Three which made me feel ten times better. This training cycle is flying by, but in a good way. I actually think marathon training in the summer is much more difficult than in the winter. I’m kind of missing my chilly runs, but I know I miss the heat the second it leaves, so I’m not complaining. These tough, humid runs make us stronger. I’m just so thrilled to be training again without injury. I don’t take a single day for granted. And I’m proud of my half marathon PR in the middle of marathon training with only six weeks back at it. I didn’t know I had it in me, but I’m serious about this comeback! Bring on week eight! 76 days out. So, why did you sign up to run 26.2 miles? You know you like a challenge. You know you can accomplish a goal if you put in the work. You know you love that half marathon finish line feeling, so the marathon has to be even better. You know that it won’t be easy and not everyone can do it, but good things come from hard things. I know you’re going to have a few freak outs. You’re going to question why you signed up. You’re going to regret staying in on some Friday nights as a 21 year old. You’re going to doubt you’ll ever be able to run for 4 hours. But guess what? It’s worth it. And here’s some advice to help you get there. THIS is probably the most valuable thing I learned. If you start looking at your September mileage and your 40+ mile week in week one, you’re going to feel a little intimidated. Just look at the week you’re in. You can look ahead to your upcoming long run, but don’t start thinking ahead to the 20 miler. Run the miles you should today. And do the same tomorrow. Take it one day at a time. You’re allowed to feel a little nervous. This is new. This is a challenge. But do not be fearful. What are you really scared of? Scared you’ll run farther than ever before? Scared you’ll like it? Or scared you won’t? Fear can be hindering and I promise there’s really nothing to be afraid of. I want you to be proud of every single long run. Be proud of each new “farthest run” your Garmin chimes in to show you. Getting to that marathon start line isn’t about one huge run or one great week of training. It’s about a collection of efforts day in and day out for months at a time. That takes dedication. And you deserve to celebrate every hour of hard work you put in. Treat yourself to that post-run latte. Go buy a new running outfit when you reach over 13 miles. Celebrate yourself. If you want to have the energy to run for hours you’re going to need to be well rested. I get it – you’re 21 and feel like you can sleep when you’re dead, but sleep is more important than you think. Sleep helps your muscles recover. You need it. Some days will be harder than others, but try to prioritize sleep as much as you do the actual runs – it’s all part of training. You don’t know how you will feel at mile 20. You don’t know if you’ll hit the wall. 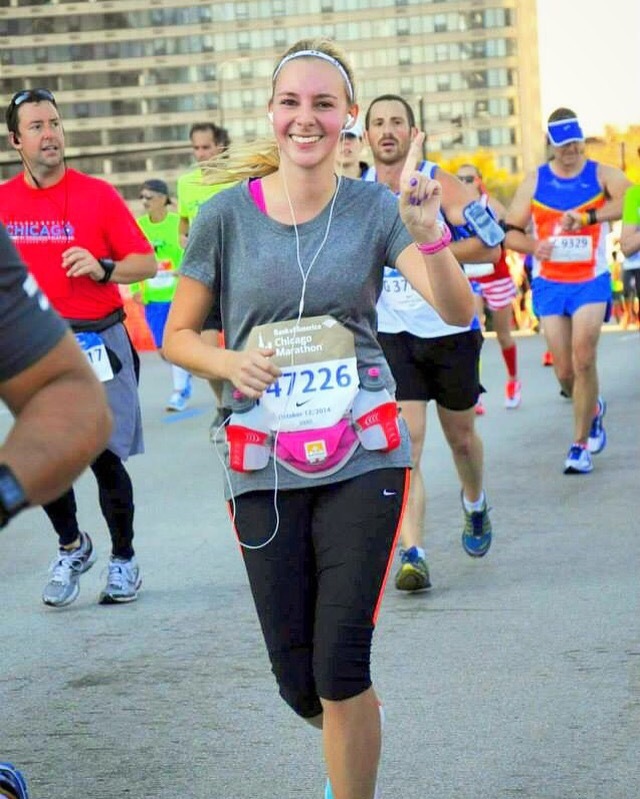 And you’ve never run a marathon before so why set a time goal? I strongly believe that the only goal for a first marathon should be to finish feeling good. I get that you could estimate a finishing time based on your half marathon time, but this is a very different distance. Finishing should be the goal. There shouldn’t be any disappointment in your finishing time. We can talk time goals after you’re on your second full training cycle. You’re going to have some quiet solo runs, so you’ll want something motivating playing in your ears. For long runs, check out Rich Roll’s podcast. Time will fly by listening to inspiring stories. For speed workouts? Find your pump up songs. And anything you find that gives you the feels. The “I want this playing as I cross the finish line” thing? Start adding those songs to your race playlist. I know you won’t forget Dog Days Are Over by Florence and the Machine, Stronger by Kelly Clarkson, or Schoolin’ Life by Beyoncé. This one is tough, but try. Don’t think about calories in/calories out. If you burn 1500+ calories in a run, you need to refuel your body. And not with junk. Don’t get home, eat some pretzels and think that’s enough. Don’t skip a meal just because you know you’ll be drinking that night. Your body is working hard to achieve a goal for you, so help it out. Treat it well. Fuel up with substantial meals – that includes the night before your long run. Put some effort into your meal. If you feel lightheaded while running, think about why. You can’t expect to run for hours on an empty stomach. Have some toast before you head out. Bring your Clif Bloks to eat every 30 minutes throughout your run. You might not think you need them, but you do. And you’ll need to get your stomach used to them. It’s okay to not have this all down your first time around, but you love what your body can accomplish, so treat it with respect. And here’s a spoiler: by marathon three you’ll have no shame in your post-run breakfast game. I know you love to run and that’s all you make time for, but trust me on this: you need to cross train. Bike occasionally. Try yoga. Do your hip exercises. Lift some weights. Skimping on this area will catch up to you. So, be smart. You’ll help prevent injuries if you dedicate some time to some other exercises besides running. This sounds a little silly, but you should practice your water intake. With half marathon training you haven’t needed that much water – an occasional stop at a water fountain wasn’t a big deal. But with marathon training, you’ll want to carry water on you. Get a water belt. Drink before you’re thirsty. Get your body used to taking in fluids while you’re moving. This is a crucial part of a marathon. And if you really want to look like a pro? Get some paper cups and practice drinking out of them while doing a slow jog (maybe somewhere without a lot of visibility since people will probably judge you). Drinking out of a cup while moving really does take some practice. Bend it and take small sips. Yes, some will end up on you, but that isn’t the worst thing. One little practice session and I’ll bet people won’t peg you for a first timer. Guess what? When you tell people you’re training for a marathon, they might think you’re a little crazy. You’ll get a lot of responses like “Oh wow I can’t even run one mile” or “Be careful you don’t want to destroy your knees.” Everyone has their own opinion and that’s okay, but you’ll want to surround yourself with people who support you, even if they don’t get it. You’ll want your friends to be willing to stay in with you some Friday nights or for your boyfriend to show up at 5 AM to watch your race. You’ll feel more motivated if you have supportive people to vent to. Positive, supportive people matter more than you know. You won’t be the runner you are without their support. And don’t be afraid to get out of your comfort zone and join a team later on. Supportive people who understand your crazy love of running are the best kind of friends (and you’re going to find some absolutely amazing ones). When it comes to race day you’ll appreciate having some distractions. Take in the crowd. Feel grateful for every step you’re taking. And think about what it took to get you there. The week before the marathon I want you to think about everyone that played a part in your journey. Take out a piece of paper and label it 1-26. Write down the name of a person that helped you get to where you are for each number. Memorize it. And while you’re running that specific mile: dedicate it to them. Thank them. Think of them. It will help the race fly by. How cool is it that you have that many supportive people in your life? You’re lucky. And that last 0.2? That’s for you. Through all of this I want you to have faith in yourself. Trust your body. Trust your hard work. You will be able to do this. You work hard for months so you can be prepared come race day. You’ll be prepared. Try to remain relaxed through training and trust the plan. Not every run will go how you want it to. Not every week will be perfect. You might miss a few days of training. You might skip a long run. THAT IS OKAY. Don’t be too hard on yourself. Marathon training is a learning process (that never changes whether it’s your first or your tenth). So, learn. Learn what works. Learn what doesn’t. But always always trust in yourself. You have to. Right now you do not know how much of an impact this journey and this race will have on you. I know you’re thinking you’ll be a one and done kind of girl. You think you can cross 26.2 miles off your bucket list and move on. It’s okay to think that way. It’s okay if that’s what you decide. But I’ll let you in on a little secret: you’re a marathoner at heart. This is your distance. You and marathons have a lot ahead of you. New personal bests, new destinations, new lessons learned. No marathon is the same. No training cycle is the same. So remember that as you work through your first one. You and the marathon? You’re about to have a lifelong relationship. I dare you to train for a marathon and not have it change your life.